Three Roger Mills County youth will be competing at the International Finals Youth Rodeo held July 9-14 at the Heart of Oklahoma Exposition Center in Shawnee, Oklahoma. The IFYR will offer more than $250,000 in prize money for contestants to pursue. Joining top high school rodeo athletes from across the United States will be Sydney Bottom of Cheyenne, Trey Kimzey of Strong City and Ean Price of Leedey. 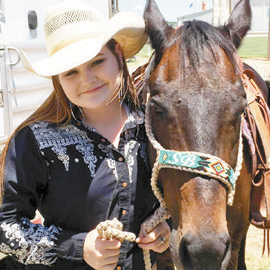 Sydney will be competing in barrels and goat tying and will be riding for the Spicer Gripp Team. Trey will be competing in bull riding and will be riding for the Bloomer Trailer Team. Ean will be competing in saddle bronc and team roping.